Last week, a high-ranking Vietnamese naval delegation paid a visit to India. While this is just one of a series of scheduled defense engagements by the two sides this year, it nevertheless put the spotlight on the growing security ties between the two countries within the wider bilateral relationship. As I have noted before in these pages, Vietnam and India have been looking to advance their existing defense relationship as part of their wider ties, which were elevated to a comprehensive strategic partnership in 2016. Defense ties have grown in recent years to include not just the traditional components like exchanges and port calls but also the training of personnel, capacity-building funding and equipment, and coast guard collaboration. That trend has continued into 2018 as well, within the wider context of rising conversation around the Indo-Pacific and various visions advanced on the concept. 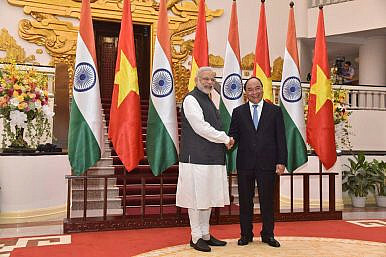 This has included developments in the relationship in general, such as the visit of Indian President Ram Nath Kovind to Vietnam in November, where defense issues including capacity-building were discussed, along with defense-specific events including the first visit of a Vietnamese coast guard vessel to India last month. Last week, naval ties between the two sides was once again in focus with the visit of a Vietnamese delegation to India. The commander of the Vietnam People’s Navy, Vice Admiral Pham Hoai Nam, led a high-ranking delegation on a visit to India from December 4 to 8 in a trip framed around the advancement of naval ties between the two countries. During the visit, both sides held several meetings, including between Nam and Admiral Sunil Lanba, the chief of the naval staff of the Indian Navy. According to Vietnamese state media, the meeting with Nam and Lanba exchanged views on the state of existing cooperation and also addressed directions for future collaboration as well, including personnel training and technical maintenance. As is typical with such engagements, not much was publicly disclosed about the private deliberations by the two countries. Beyond those meetings, the visit also included other interactions as well that symbolically highlighted aspects of ties. This included the Vietnamese delegation observing several naval units, submarines, and warships of the Indian Navy in Mumbai city in the state of Maharashtra, and ceremonial engagements such as the laying of a floral wreath at India Gate for fallen Indian soldiers.